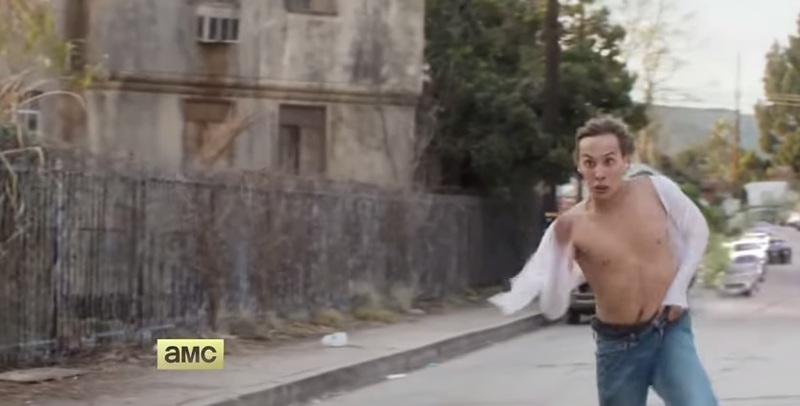 A teaser trailer for The Walking Dead spin-off Fear the Walking Dead dropped today, showing Harry Potter actor Frank Dillane absolutely storming it down the street away from some unknown terror. Obviously, given what we already know, it’s likely to be the ‘zombies’ (although they are never called that!). Am I the only one who sees this and just doesn’t care?! I moaned about this when it was announced out of the principle that it is a spin-off and the amount of derivative material being released is making me mad. But I had thought the trailer may sway me a little, but no. It is only a teaser, and we have until its U.S. release in August but I watched this and felt nothing. We don’t know much about the show except it will be in the same vein as The Walking Dead but it will be set in Los Angeles with a fresh set of characters, including an engaged couple (Kim Dickens and Cliff Curtis) and her children, facing a zombie apocalypse. Why does that sound familiar? Oh yeah, that’s right – I’ve watched five seasons of it already. I do not see how this can present us with enough stuff we haven’t already seen before. Sure, the dialogue and characterisations will be different and they may end up facing different challenges but is it really enough to sustain a whole new TV show? I’m getting bored of The Walking Dead, it only excels in a few episodes per season, so I’m sure as hell not going to watch more!! This just seems cash cow to me and so I’m mad. I cannot imagine myself watching it. I love Pretty Little Liars but I didn’t watch its Rosewood spinoff and I stopped watching Marvel’s Agents of S.H.I.E.L.D. as I feel like I watch enough Marvel superhero films, so I don’t need a TV show as well. I think producers sometimes need to stop thinking about the $$$$ and consider over saturation and ‘do we really need more of this?’ I will be very interested to see how it does. « Madonna vs Taylor Swift: Whose has the best star-studded video?